The Mondays are a bundle of interesting parts working better as a whole...everyone contributing their own unique brand of mental and emotional disorder to the group...whether it's Don's neurotic episodes and sweet harmonies, Kevin's hair band like exuberance and powerful fills, Ken's perpetual perfectionism and pop lyric genius, or John's giant Ego and slashing guitar...when you put it all together, it's magic. The Mondays are an original pop rock band out of NYC. 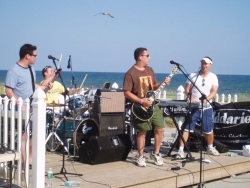 Their catchy, radio friendly style has won them fans and friends throughout the northeast.